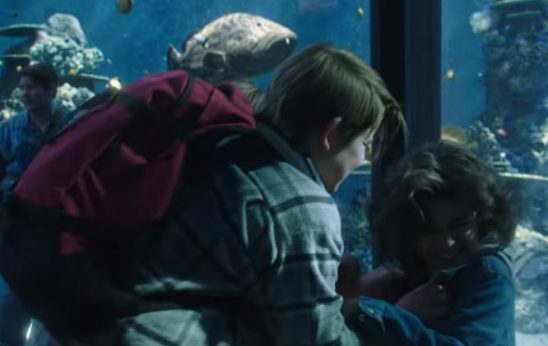 Aquaman has a scene where bullies slam the boy hero against a tank, so the writers have an excuse for him to create shark-on-tank collisions that will probably cost this poor aquarium millions of dollars. We’ve all seen it countless times: the good-looking and talented protagonist goes to school, only to be physically assaulted by villainous children. These bullies don’t like the protagonist because they’re new to the school, or their parent is dead, or they’re different in some invisible and undefinable way. So, they slam the main character against the nearest wall and grab their lunch money. Good thing the protagonist has some magic or a giant robot friend, because otherwise they’d get beaten up every day. From the recent Aquaman film to the classic The NeverEnding Story, it feels like every movie or TV show with a school-age protagonist pulls out this cliché. Screenwriters seem to think it’s their “get sympathy free” card. Throw in some bullies, and with little time and even less thought, their protagonist becomes an underdog. The cliché is less common in novels, probably because the greater length allows for more nuance. The problem with this pattern isn’t that bullying is the subject matter; it’s how cheap these depictions of bullying are. 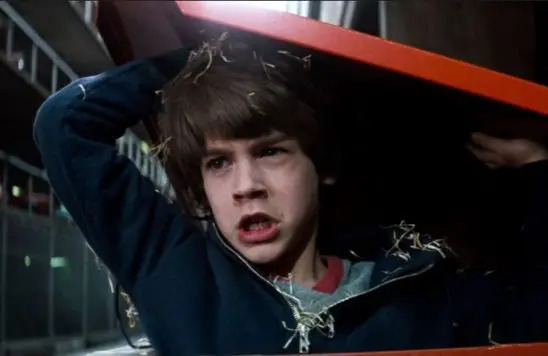 In The NeverEnding Story, comical bullies put Sebastian in a dumpster. After growing as a person, he is able to put them in a dumpster. A heart-warming tale. Like any cliché, bullying scenes are disappointingly unoriginal. But more than that, bullying is a serious issue. Treating it so thoughtlessly is not helping the real kids who are getting hurt. The bullies shown in these stories are more physically violent than any kids that ever bullied me, or indeed, any kids I have seen in my life. This is not to say that bullies in real life never use physical violence, particularly against kids that face extreme marginalization in their communities, but that’s not how most bullying manifests. Most bullying is harassment, much of it designed to humiliate the victims and destroy their feelings of self-worth. Bullies don’t have to physically hurt their targets; with enough emotional damage, the victims will hurt themselves. Screenwriters probably don’t want to use harassment because too many people don’t understand how harmful it is,* and it’s not easy to demonstrate that harm in five minutes. So instead they pull out something they know their audience will react to. But doing this only makes people think that real bullying is physical rather than psychological. As a result, bullies who engage in harassment are allowed to continue, which is probably why it’s their favorite tactic. Exaggerating bullying isn’t productive either. All kids need to be taught not to wield emotionally abusive language or violate other people’s boundaries. When we spread the idea that bullies are kids waiting to grow a twirly mustache, what parent will be willing to admit their kid is a bully and teach that kid better? If an adult protagonist left work every day only to be mugged by the same people, what would we expect to happen? Let’s see, how about… calling the police? In a story where it’s important for this adult to face the muggers on their own, there would at least be a little dialogue or some thoughts explaining why the protagonist won’t report what’s happening to the authorities. But in most of these cheap depictions, no one even mentions that some adult at the school could intervene. Bullying is just what kids do, and any kid who’s targeted has to face the perpetrator on their own. Or worse, a kid who reports their victimization to a teacher is a “tattletale.” This is convenient for storytellers, because having an adult save the day would reduce conflict and take agency away from the youthful protagonist. Convenient for us or not, this isn’t okay. In real life, schools absolutely have the responsibility to ensure a safe environment for every student on their property. Intervention and discipline from school officials can stop bullying. But too often schools don’t stop it, either because they don’t think they have to or because students and parents don’t realize that’s something they should demand. This assumption leads to countless kids getting bullied when it could easily have been prevented. The reasons that most movies and TV shows give for why bullies target their protagonists are patently absurd. Kids aren’t picked on just because one of their parents died, and they certainly wouldn’t be picked on for having superpowers. The reality is that bullies are not interested in targeting kids they think can fight back; they choose victims with the least amount of power and social support. Most often, that means their targets are unattractive, lack social skills, are part of a marginalized group, or all of the above. Since it looks like I struck a nerve here, I’d like to clarify a few things. Bullying is something that happens when a kid with more social or physical power targets another kid with less. Occasionally kids attempt to bully someone with as much power as them, but it doesn’t last long, because the target can put up a strong defense. It’s certainly possible for an attractive kid to be bullied, but their attractiveness still provides social power. That makes them less vulnerable to bullying overall. But the average studio is unwilling to give protagonists any traits that would actually make them a target. Every protagonist has to be attractive, sociable, able-bodied, neurotypical, straight, cis, and white. Most movie stars more closely resemble a typical bully than a bully’s victim, and the continued over-representation of this narrow group of people only perpetuates the same imbalance of power that allows bullying to flourish. Instead of giving protagonists some diversity, too many storytellers are appropriating the experiences of marginalized kids to use in stories about privileged kids. If they don’t do it by depicting a super privileged kid being bullied for no reason, they’ll do it by making a sidekick the bully’s target instead. This way the attractive protagonist can prove themself to be an exemplary human being by protecting such a lowly person from the bullies. This latter trend of using a less fortunate side character is just as exploitative. Spider-Man: Into the Spider-Verse creates great school conflict without bullying. As many written works show, there’s a plethora of more thoughtful and original ways to create conflict in a school setting. 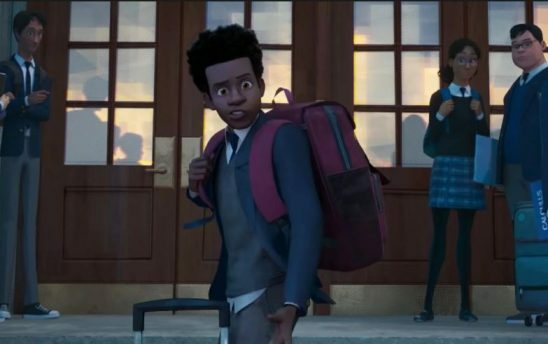 In Spider-Man: Into the Spider-Verse, Miles has just left his old public school for an expensive private school he earned a scholarship to attend. He doesn’t want to go. Scenes in the movie show him walking by his former classmates as they head to class without him, demonstrating how well he gets along with them. When he arrives at his new school, his dad embarrasses him the way parents do, the other students don’t understand the culture he comes from, and after losing his way, he’s reprimanded by a teacher for being late. As a new middle-class black student in a school of upper-class white kids, bullying is actually realistic in this situation. But rather than subjecting viewers to the harsh reality of something they might have to deal with in real life, the movie focuses on Miles’s internal journey. Viewers understand that when it looks like everyone is watching and laughing at Miles, it’s just a reflection of how he feels out of place. When Miles learns how to be who he wants to be and also succeed at his new school, it’s more satisfying than if he had just learned to spiderweb some bully to the ceiling. School is naturally full of conflict. Kids are often under pressure to get good grades and are forced to participate in activities they’re terrible at – in front of lots of other people. They are made to work on a team with other kids who may be complete assholes, and even students who don’t intend to be rebellious may clash with teachers. Sure, most schools aren’t arenas where kids battle to the death. And in most stories, it’s a mistake to try to make them one. * Keep normal school conflicts focused on meaningful interpersonal interactions and the protagonist’s character arc. Let your magic or robots bring on the excitement. In the Harry Potter series, Draco is a bully, but he isn’t usually Harry’s bully. He’s Harry’s rival. Draco doesn’t choose to pick on Harry because he can get away with it; Harry embarrasses him at the start of their first year. Once that happens, Draco’s pride is at stake. Draco has a powerful family and lots of social support he can use as a weapon against Harry, but Harry is famous and talented. While Rowling often manufacturers reasons for Harry’s classmates to be angry with him, she doesn’t pretend that he would be picked on at Hogwarts for being who he is. Because he wouldn’t. The kids we know are regular targets of bullying at Hogwarts – Neville and Luna – really would be bullied. Neither of them have many friends. Neville is talentless and afraid of everything. Luna constantly states wild theories as though they are facts. Harry is nice to them, but they aren’t in the story just to be damsels for Harry to rescue. Rowling does describe how Harry is bullied before he attends Hogwarts, and it’s surprisingly realistic. He’s scrawny, and he’s made to wear really old, baggy clothes. His primary bully is his cousin, who’s been taught to be cruel to Harry at home. Back then, Harry couldn’t control his magic well enough to fight back. The Harry Potter books are by no means perfect in their depiction of bullying; Rowling treats really abusive behavior like it’s just unkindness and lets the school off the hook for keeping kids safe. However, the books do show that it doesn’t take much added effort to break out of this tiresome cliché. The main characters don’t have to be outcasts to be sympathetic, and they don’t have to be bullied to have an enemy in the schoolyard. This is a taller order. To do justice to real-world bullying, it’s important to not only show what it really looks like but also to demonstrate to audiences that it is harmful. In a cultural climate where too many people dismiss bullying as just a normal part of life, it will take time and care to teach them otherwise. If it’s not important enough to your plot to fully address the issues you’ll raise by depicting bullying, it’s better to leave it out. Otherwise, you risk normalizing the behavior instead of challenging it. For an example of what real bullying looks like, I’d like to point to a few scenes in Spider-Man: Homecoming. In the movie, Peter Parker’s best friend tells some classmates that Peter knows the famous Spider-Man, hoping to help him make a good impression. A bully in class instantly seizes on this perceived foible. Assuming it’s a lie, he makes fun of Peter loudly in class and, later, over a microphone when he’s DJing at a party. His loud, public comments are designed to humiliate and socially isolate Peter. He also chooses to focus on something real he thinks Peter will be embarrassed about, making it more likely that Peter will internalize the abuse. Of course, in the context of the movie, it doesn’t actually hit so hard. Peter is actually Spider-Man, and as an attractive white boy with a Stark internship, he’s unlikely to be bullied. Depicting bullying correctly would mean focusing on a character who would actually be targeted in real life. It means communicating to the audience how the protagonist dreads going to class, how they lose confidence, and how everyone else watches and does nothing. Then the story must have constructive messages about how this abusive behavior can and should be stopped in real life. It’s not a light topic, and it would be best handled by someone with personal experience being bullied who wants to do the issue justice. As fantasy and scifi geeks, there’s one more thing we should keep in mind. People aren’t bullied for being geeks anymore. Today our interests are cool, or at least mainstream. So let’s not pretend our protagonists would be picked on because they like Narnia or Star Wars. Our depictions matter, and we can do better. And let’s face it, screenwriters probably don’t either. Let the plot crimes of Harry Potter and the Goblet of Fire be a warning to us all. 2. it’s such a short scene, so I thought the movie makers were more interested in showing his fish-telepathy-powers emerging in a highly dramatic way, rather than making him into a bullied underdog. I mean, this is the only scene we get of other kids being mean to him. We quickly move on to him being an adult, and he seems pretty popular then. (Among humans, that is, not counting racist Atlanteans). STILL, I totally see the overall point of the article. Wow, my bullies must have consumed too much cliched media, because it was a daily experience of getting punched in the gut, choked, tripped and shoved into walls for me. I’m sad to hear that. I experienced less physically violent bullying myself (even though the bully was a boy – the more social bullying is usually more attributed to girls). It lasted until two of my teachers got wind of it and gave the whole class hell for what they let happen – both teachers were strict and highly respected, so their words really counted for something. One issue with this that comes to mind in both the Harry Potter and I am assuming Aquaman(I haven’t seen it) examples are that the character has magic of some sort but no one believes this to be true because of the masquerade. So they are the subject of bullying because they appear to be a “freak” out of context in that their magic cannot possible be real. Yet another reason why plots involving the masquerade are problematic. In case of Harry Potter, though, the bullying by his cousin happens mostly before he learns he has magic (and there are mentions of accidental magic he used before). Since Harry is abused by all of his aunt’s family (mostly because Petunia hated her sister for being magical), Dudley has been brought up to hate his cousin – it’s not a surprise from that background that he bullies Harry (especially since it’s clear Harry’s uncle, too, is a bully at heart). He’s never punished for it, neither by his parents nor, which would have been more likely in this case, any of the teachers at the regular school he and Harry went through. The bullying by Draco happens at school, but has nothing to do with being a freak – since here we’re talking about two wizards in training. It really comes from Draco’s idea of having been humiliated at the beginning of their time in school – after all, after denying Draco’s friendship, Harry’s best friends are a poor wizard whose family is too muggle-friendly for a pureblood and a muggle-born girl. Yeah Aquaman has this really weird masquerade premise about there being huge powerful underwater civilizations that humanity doesn’t know about. I think the plot was pretty clichéd, but I still enjoyed the movie SO MUCH because of the spectacle and the awesome underwater environments and creatures. But yeah, the quick bullying scene indicates that the other kids think Arthur is weird with his fish interest. Then it’s fast forward to when he’s an adult, most of the world knows about his existence although he’s a bit of a mystery, but some locals know who he is. They make this jokey scene where a bunch of tough guys come up to him in a bar and it looks like they’re gonna try to oppress him for being a mage, but actually they’re fans and want to take selfies and drink with him. Everything you say about bullying is pretty much on the mark, though I went through a lot of physical violence as well at emotional. What is missing is the community. Bullying isn’t really about two kids. Or two kids and a few of the bully’s entourage. When we frame bullying as an interaction between individuals without any context we make it all but impossible to really deal with the the issue. Communities create the circumstances to allow bullying. They push the one on the margin further away, not so much out of cruelty, but as you say, school is already a hotbed of angst, and deliberately working to include those on the margins is adding extra to the burden. Bullies are either close to the top of the social ladder, and use bullying as a way to maintain their position, or they are also on the margins and try to move up through bullying. These are often both victims and bullies at the same time. The other thing you don’t cover is that bullying doesn’t stop after school. Many bosses are effective bullies. They get things done by grinding down and humiliating their employees. There are bullies in choirs and orchestras, in bowling leagues. Pretty much anywhere where social status is an issue – so anywhere aside from Crusoe’s desert island. We Germans refer to bullying in a work environment (which often has to do with power play of some sort – either between the boss and their employees or between employees vying for better jobs) as mobbing, though. Its great that you mention the community aspect. Bullying, in most cases, is a show – the bully does what he does in front of other kids, to score “kudos points” or “brownie points”. The bully is out to impress his/her friends and gain social status, at the expense of lowering the social status of the bullied. This usually works. Speaking from my own experience (in a working-class all-white school between ages 7 and 15) – for kids at that age, social standing is a zerosum. To gain some, you need to take it away from somebody. The ability to dish out suffering on others is a highly praised skill in school. Most teachers at that time (early 90s) also accepted this. This is exactly why the same kids, as you said, “are often both victims and bullies at the same time”. Kids gain and lose respect, acceptance and love through violence. It is a real problem that adults see this and accept it among kids, all the while they accept none of that amongst themselves. Anyone interested in a depiction of bullying that doesn’t do any of this should go read the first chapter of Worm. Warning: every trigger warning ever. Its a great article, thank you for writing it. I strongly agree with the overwhelming majority of what you wrote. We should be careful how we use that term, as privilige amongst adults is something very different than what counts as privilige amongst kids. In my class the most bullied girl was the one that was the most pretty (arguably, she was the prettiest girl in the whole school). The girls bullied her mercilessly, inlcuding braking her arm at one point. She likewise received quite a bit of rough horseplay from guys as well. Sure, she was neither the most nice nor the most smart of the girls. But that was not why she was picked on (there were many far less nice and more dumb girls than her). Her beauty was the primary factor in the bullying and arguably the main reason why other girls picked on her more violently than on anyone else. We all knew about this, it wasn’t a secret. 2. Violence and harrassment in bullying. You have stated that “most bullying is harassment” – maybe today it is, or it was like that in your area. From my own school experience, I’d say violence was 60% or more of all bullying. Violence was almost always followed up with harassment, but “harassment without violence” was pretty much non-existant. All cases of bullying included some form of violence. It wasn’t always simple beatings. Often it was throwing kids out on the wrong bus stop, or holding them and preventing them from getting out at the correct bus stop. Another example was kids being caught and held down so they wouldn’t be able to go to the cafeteria and eat during lunch (this also prevented the bully from eating, which is why bullies stole or brought their own lunch). But all in all, the physical over-powering of the victim (often by 3 or more bullies ganging up on him/her) was a necessary component. Also we can argue about the severity of the impact of harrasment and violence. Personally, I’d gladly take 8 years of insults, alienation and “passive harassment” over 1 year of violence. In my experience, violence is clearly the most destructive form of bullying. Bullying, from my experience is strongly tied to working-class culture. At least here. To clarify: I went to an all-white school in an European country where over 99.5% of the population is white and 98% or so is of the same ethnicity and language. The school was overwhelmingly blue-collar and most kids were poor. Coming from the lower ends of the middle class (my mom was blue collar, my dad a white-collar scientist), I was one of the richer kids here. Bullying was constant and ubiquituous, teachers did nothing at all about it and brushed away parent’s concerns. I was buillied, but I’ve also participated in bullying (mostly out of fear of ending up on the receiving end if I failed to join the majority in the bullying or stand up for the bullied kid) – something I’m not proud of at all. The head bullies and propagators of the bullying culture were all from the working class and they used violence expertly. They explicitly targeted some kids because they thought he/she was “too weird”, “used big words” or otherwise felt he/she is not coming from the same background. I tried very hard not to let people know my background. That is not to say that the bullies didn’t bully other working-class kids as well, but being from a different class was a reason enough in itself to get you bullied. Likewise being an atheist or from a non-christian religion would automatically send a lot of violence your way. Later I graduated to a high school that was overwhelmingly for rich and upper-middle-class kids, where I was the poorest kid in class. There was no bullying in said high schoool. None at all – zero. Those kids who came from blue-collar schools all had previous experiences with bullying, but none of us felt the need to continue it in this new upper class school. I think it was at that point that I realized that bullying in my country does have a working-class core component that one can’t ignore. I talked with people from other countries here like Romania and Estonia and they had the same experiences: bullying was absent from upper-class schools. Questions of class are divisive, controversial and difficult, especially in a nation as uniform as mine. But we should not shy away from difficult questions if we want to find the solutions. To 1: It speaks for itself that the girl got most bullying from other girls for being pretty. Prettiness doesn’t make you popular with other girls in their teens – unless you learn to play society early and ruthless position yourself on top. And once the girls started, the boys went along with it. To 2: If bullying is not directed at you, you will mostly see the violence, not the harrassment, because harrassment is very subtle in some cases. I was bullied and 95% of it was harrassment. It might have a social component (I went to the Gymnasium, the highest form of secondary school in Germany, where the huge majority came from a well-off to wealthy background), but saying ‘just because I don’t see much harrassment, there is none’ is not a good thing. To 3: Bullying in upper-class environment might tend more towards harrassing – which in some ways makes it worse, because violence leaves visible proof, harrassment doesn’t. As already mentioned, I was bullied in school and I went to a more upper-class school myself. Well, in primary school (roughly age 7 to 15) bullying was certainly directed at me very often and the majority of it had a component of violence. That doesn’t mean that violence was not followed up by harassment, destruction of property or alienation. But violence was the most socially-damaging one and it was, at least to me, the hardest to withstand. With insults etc, you can always talk back. With a sharp tongue and a quick mind, you can even turn the tables and end with the bully walking away losing standing, being insulted in wittier and more funny way than he tried to insult you. With physical violence you don’t get the chance to do so. If 3 guys are holding you down and the fourth is beating you up, you are absolutely helpless and can’t do anything (even if you are strong and fit). If you have your food stolen and you are physically prevented from going to the cafeteria, you simply have nothing else but to go hungry and it spoils the whole day. I’d say the helplessness is the worst part, at least it was for me. Its worse than losing social “brownie points” or knowing that the adults don’t care. As for “visibility”, the bullies in my school knew a lot of ways to cause you a lot of physical pain that left no visible marks. I imagine they were probably using techniques that their parents used on them when dishing out corporal punishment. Plus it didn’t matter much, as the teachers didn’t care. The worst beatings were dished out on your way from school or on your way to school, so teachers could a;ways say: “It did not happen on our watch”. I agree that if bullying happens in upper-class schools, its less likely to be violence. Also girls would use violence less (whic does not mean not using it at all). I have very similar experience. Ex-USSR country, 90th, bulling in school on, let’s say, social basis. Move to another, more elite school solved all bulling issues. But I should say that I experienced bulling whereas my 1 year younger brother did not have such problems. I do suspect that root cause was in teacher attitude (we had one main teacher responsible for class). In my case it was clearly her attitude that initiate bulling. I liked how Zootopia handled bullying. At first, Gideon is portrayed as a typical bully. But there’s two layers to his interactions with Judy. First, he reinforces her internal bigotry towards foxes. Second, when he turns up again when they’re older, he’s doing well and apologizes for how he treated her when they were younger. It doesn’t have the catharsis most examples would have, but it has more nuance. I think the movie Wonder did a good job of depicting bullying in its direct and indirect manifestations.